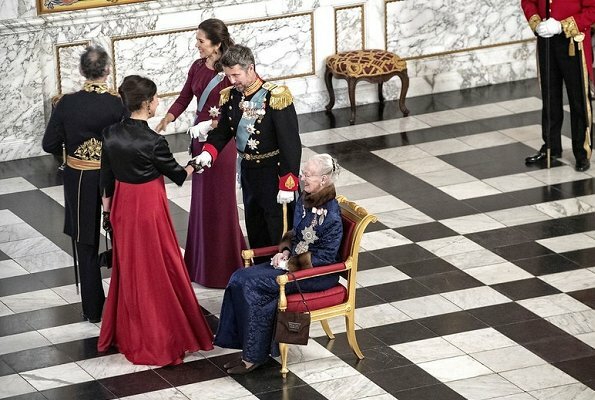 On January 3, 2018, Queen Margrethe of Denmark hosted two New Year receptions. 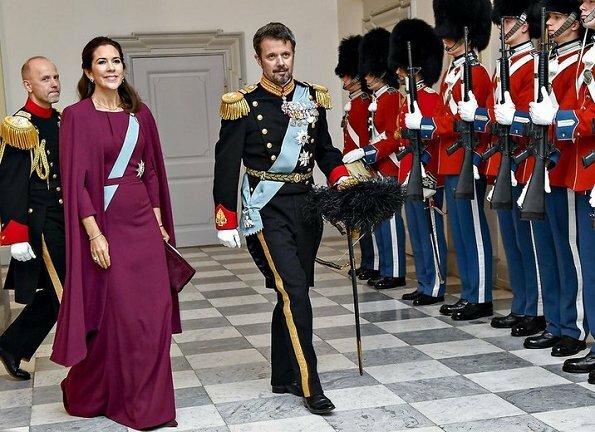 Crown Prince Frederik and Crown Princess Mary of Denmark attended both of the receptions held at Amalienborg Palace and Christiansborg Castle. 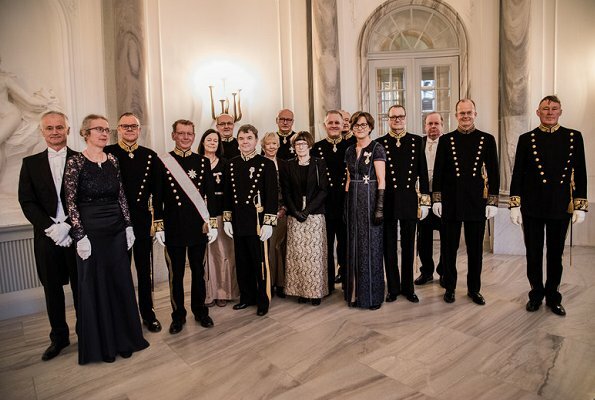 The first reception was held for Supreme Court Judges, the Royal Life Guards and Guard House Regiments. 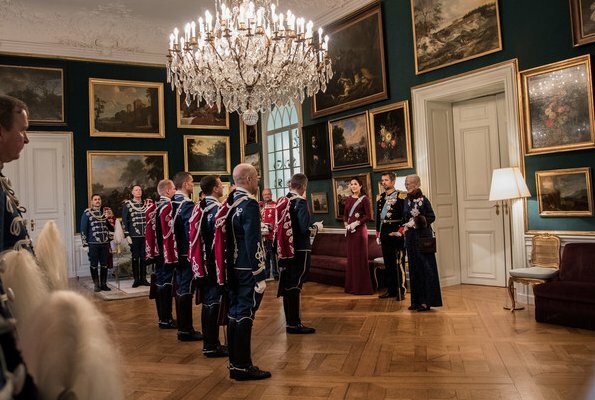 The second reception at Christiansborg Castle was held for Foreign Diplomatic Corps, Commanders and their spouses. So you're a vegitarian and wear plastic shoes? Probably un-pc, but beautiful and elegant! I love furs! 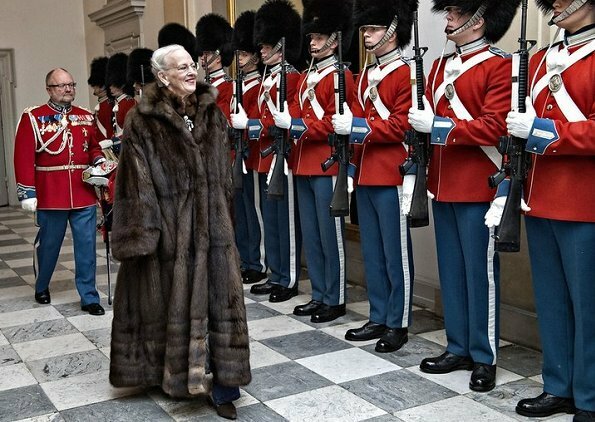 Too bad most royal women wear fake now or don't wear fur at all. The world is way to PC for me. HM's furs do not bother me in the least. They are not brand spankin' new, they have been in her wardrobe for many, many years. I know that, but no animal should have to give its skin for another. Agree with you. I love to wear my mink coat at winter time, it is the most practical coat at these cold winters we have here in north. Warm at freezing cold out, not too warm inside if you go to shopping etc. Also the same fur coat has served me already several decades what no other coat can do. Even in north ,even if it is cold,people have commen sense to prefer new technology of material who keeps us warm.I believe that animals can keep there fur becouse we have other things who can help us looking great and at the same time keep us warm,Welcome to the future. Lets take an example, a sheep. We eat it´s meat. To me it has been always a big mystery why we can eat the meat but should not use the leather and coat. How on earth is it more ecological to waste skin and fur, but instead use all those synthetic fibres what make our seas and other nature soon inoperative and never break down. I really believe all those plastic fibers will be forbid one day and our grandchildren will be laughing (or crying) aloud that we thought they are so ingenious. No new technology materials are so suitable to this climate as furs. That is a fact. I do not need to buy any fashion coats etc. waste my money and nature. I keep warm in my old fur coat. It may also last to my kids to wear. You can envy as much you like. Agree with you completely Blondiini. The fur coat is old, it was maybe not un-PC when she bought it. Just the same, she is very ostentatious in it, could wear some of her many other furs. 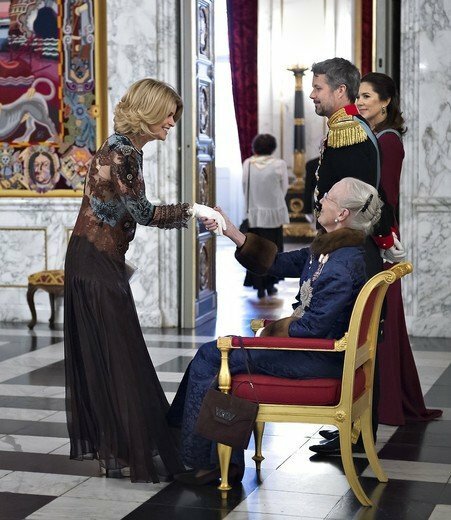 Her sister Benedikte has much more class than this show-off. 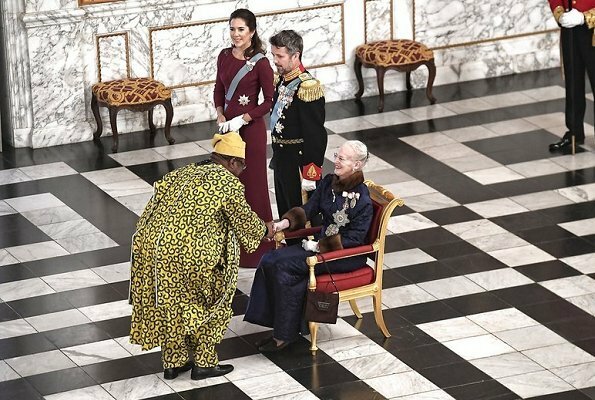 Hare Majesteit de Koningin in formidabele bontjas, zoals elk jaar opnieuw, fantastisch! To wear fur…… or not to wear fur, this mink coat is much to BIG for her!!! 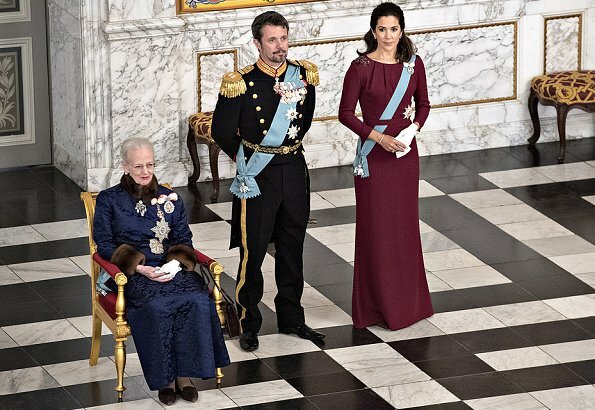 Underneath the coat The Queen wears the same blue dress year after year. CP Mary is in a new fashion outfit every year……… she is really the big spender in the Royal house of Denmark! Poor Frederik, he's in the same uniform for years, too, but perhaps he has got a new medal since last year ?!! Mary has had that dress several times before. Mary looks great as always. 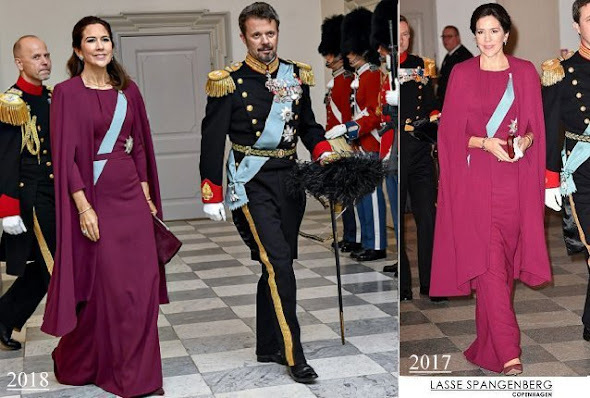 A question to the fashion-experts in here: is it better to wear the sash under the belt or over? Mary looks gorgeous in her recycled outfit!! So pretty! !